Labradorite is a Feldspar mineral- found originally on the Labrador Peninsula in Canada in the year 1770. It has been most commonly adored for its display of spectral color sometimes referred to as Labradoresence. This flash of color shows breath-taking displays of green, gold, purple, orange, red, and blue. Looking at this stone may remind one of the Aurora Borealis. 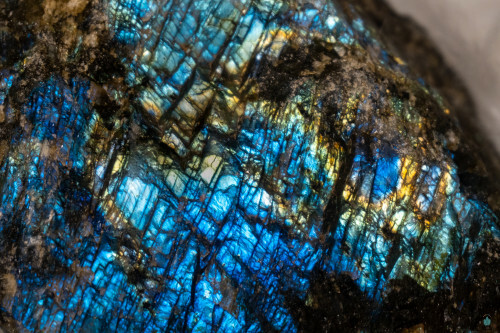 Labradorite was discovered again in the 1940s, this time in Finland. These Finnish specimens displayed the entire color spectrum described above and were rightfully called Spectrolite. 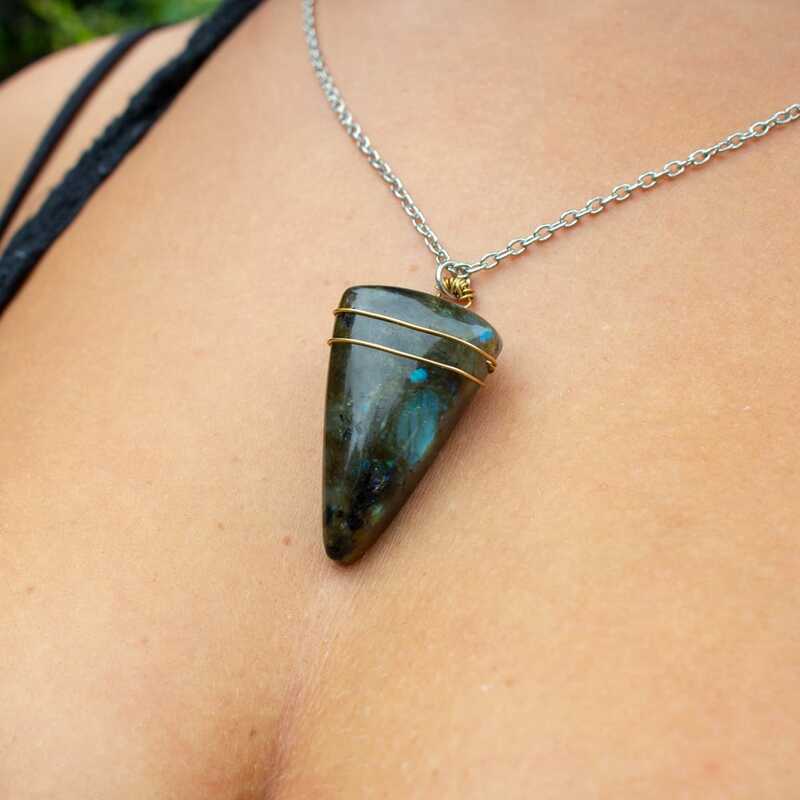 Labradorite is a stone of magic and protection. It aids one in magical and ritual work and will bring one to their deep depths where an abundance of knowledge can be discovered. 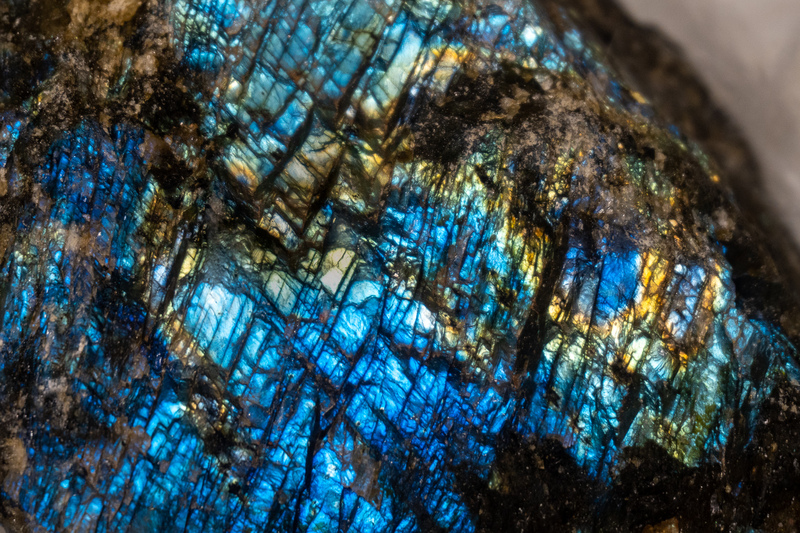 For this very reason, Labradorite is considered by many to be a stone of transformation and self-discovery. It helps one to awaken to their own unique magical abilities and powers. For example, if you are somebody who has always been intuitive, Labradorite will help to enhance this gift and bring it to the conscious mind of the user. Labradorite delivers to its user the conscious awareness to identify synchronistic occurrences. Aside from our day to day occurrences, this stone will allow for the removal of ones physical restraints and pierce the veil between the world of form and the world of the unseen. 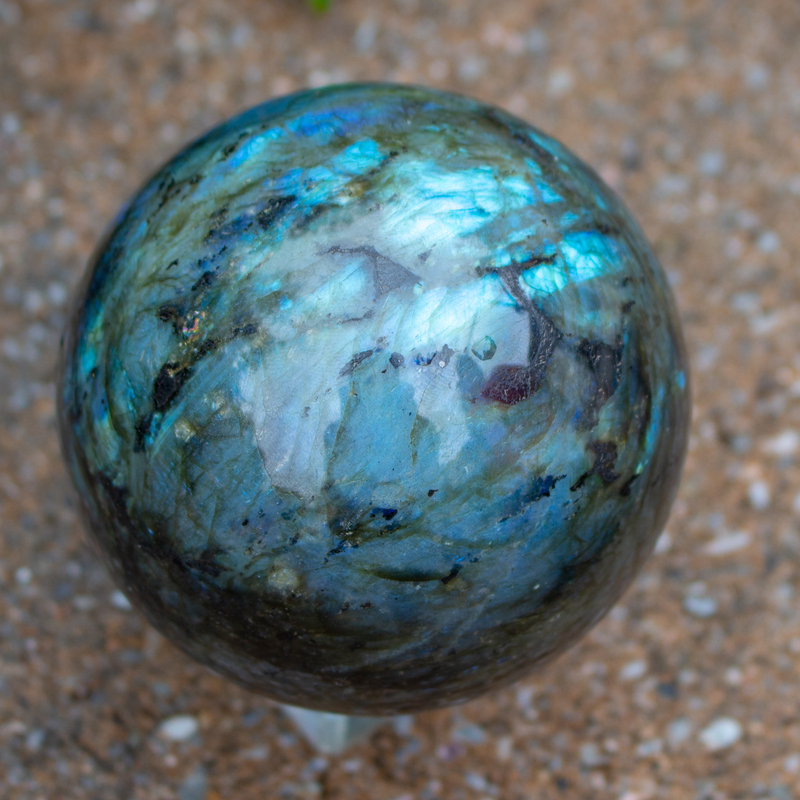 Labradorite serves only true magicians that seek to obtain power over only themselves. 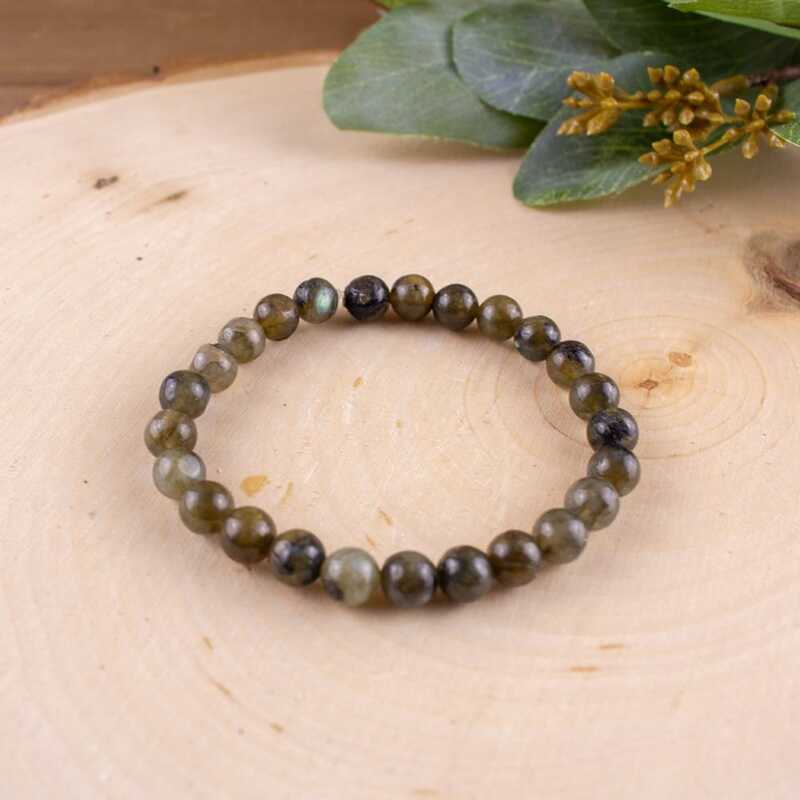 For those that attempt to use Labradorite for any other reason, you’ll find that the stone simply does not respond to any desire of external control. 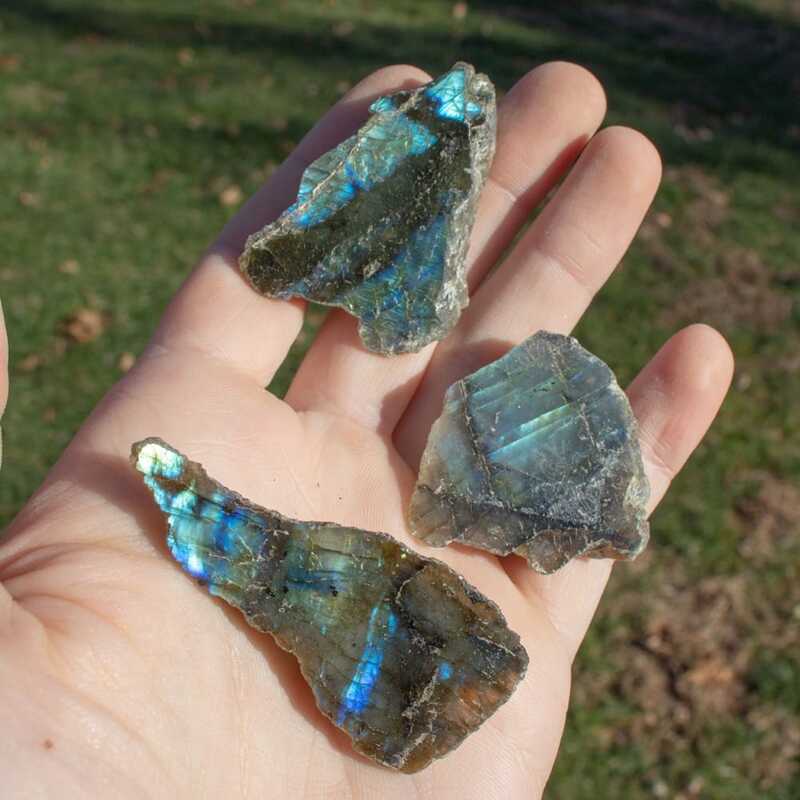 When working with Labradorite you will find that its energies are most potent during the hours of dusk and dawn. It is during the hour of dusk that we are most in resonance with the actual earthly cusp of Labradoressence. Looking up at the sky on a moonlit night when the very first stars of the evening are appearing, when the sky has become spectral with color, we begin to hear and feel Labradorite’s direct physical connection. Taking a walk into nature at this time will bring us in touch with our subconscious and to aid in manifesting your highest awareness through moon and nature energies. Labradorite resonates very well with other Feldspars such as Moonstone and Sunstone. Using Moonstone together with Labradorite will allow one to tap into the aspect of the Divine Feminine and work Magick toward ones emotions and more receptive aspects. 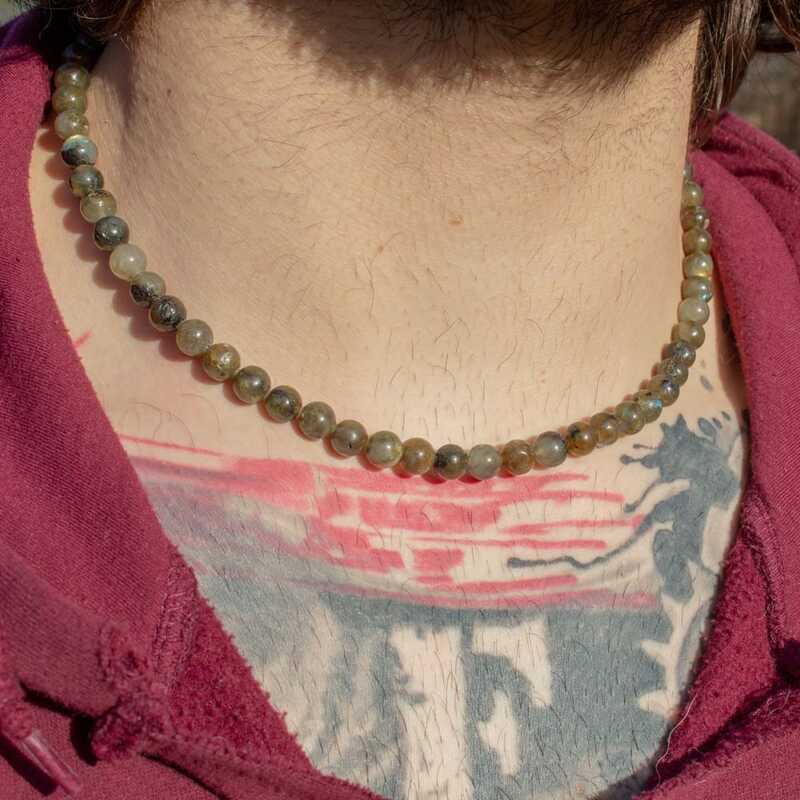 Pairing Sunstone with Labradorite will allow one to manifest through the lower chakras in Magick workings and rituals. Feldspars in general will assist one in finding what they have lost or left behind in other times. Labradorite will help you to take the journey to recover that part of yourself. Labradorite is an air stone and is therefore best cleansed on a breezy day where the air can clear its auric field. Its wind element allows one to open the inner eye and better view past, present, and future occurrences. Labradorite teaches us an incredible life lesson that what you see is not always reality. This stone holds a dark outer appearance that leaves one thinking it is nothing more than a grey stone. Upon closer observation this stone explodes with a brilliant display of spectral colors. 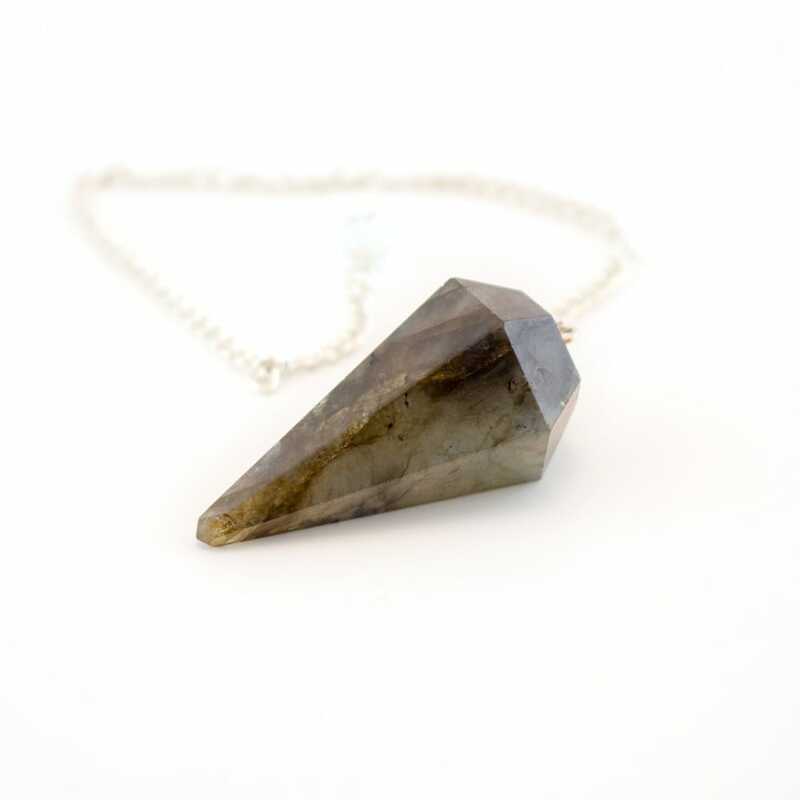 This appearance is reflective and symbolic of Labradorite’s energies because it allows one to move through the unseen realms whilst still purifying and holding one’s Light energies- A true stone of transformation and brave journeying. 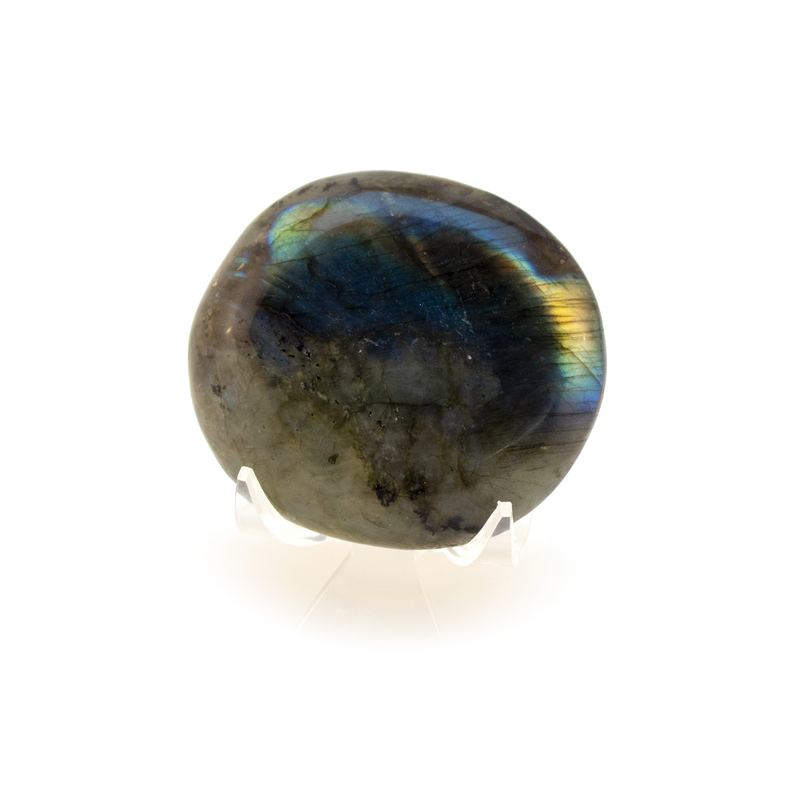 Labradorite invites us to become more adventurous and seek out what we do not normally desire. It protects us and allows us to feel safe when journeying into the dark. 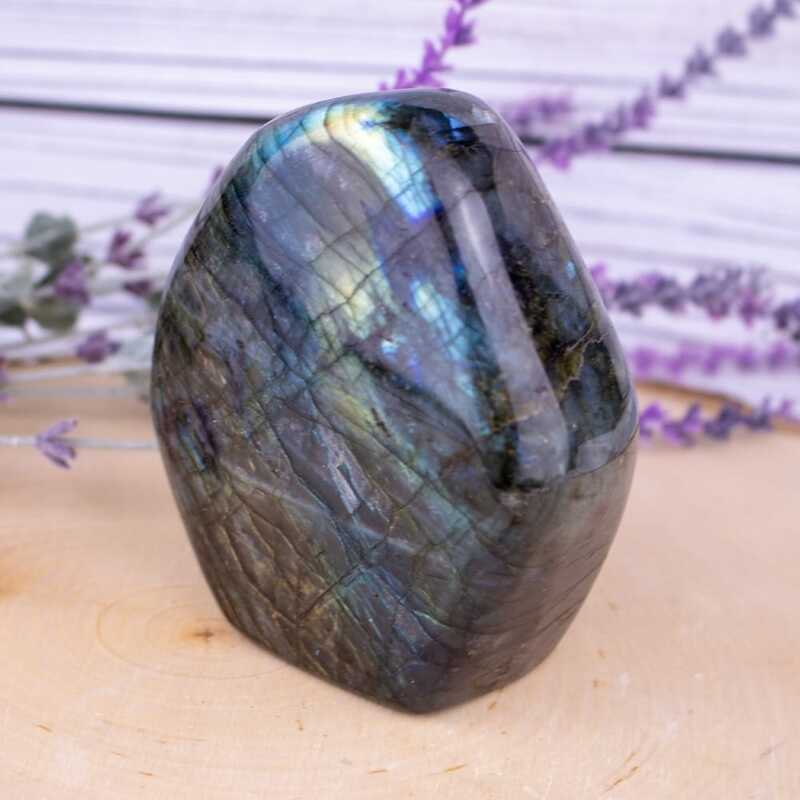 A great way to amplify Labradorite’s protection is to envision the stone transforming your body into a magickal spectral body that shines with hues of purple, gold, green, blue and violet. 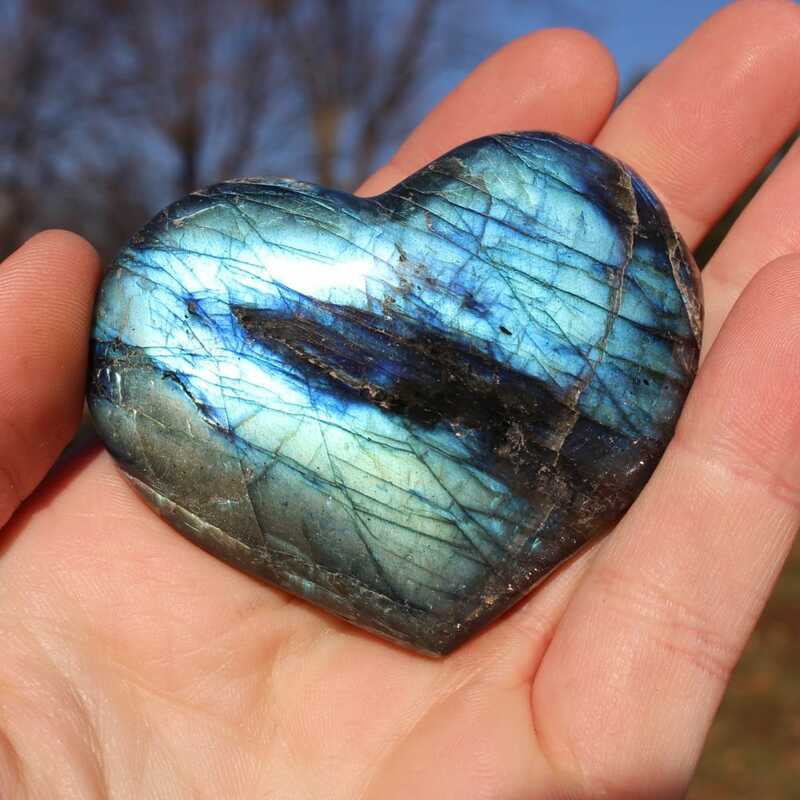 Allow Labradorite to activate your Rainbow Body, keep your vibration high and open all chakras. Labradorite has been referred to mainly as the magicians stone, but is also referred to as the Stone Of Balance. Some call this stone the Duality Stone because it helps one to understand that polarities are one energy expressed in two different extremes. Understanding this teaching from Labradorite enables us to step into balance and own both the light and dark aspects of ourselves. For those who wish to climb down into the Void, this stone becomes a serious ally. 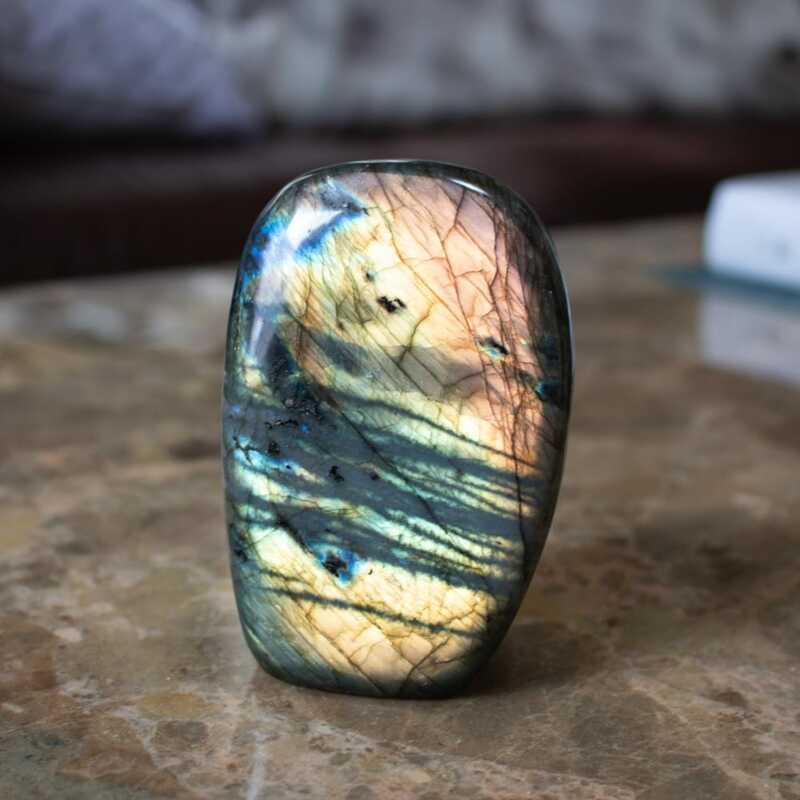 Shamans, Magicians and energy workers of kinds will find Labradorite extremely useful as it helps one to recall experiences that we hold subconsciously from other realms or even lifetimes. The Stone of Magic is best used when the user has intentions of higher awareness. Labradorite is aware of your intentions, and wants you to expand your knowledge. However, to gain this great knowledge we have to take a look at ourselves on a deeper, darker subconscious level. One must trust in the stone and know that it is keeping you protected while on a journey into the dark. 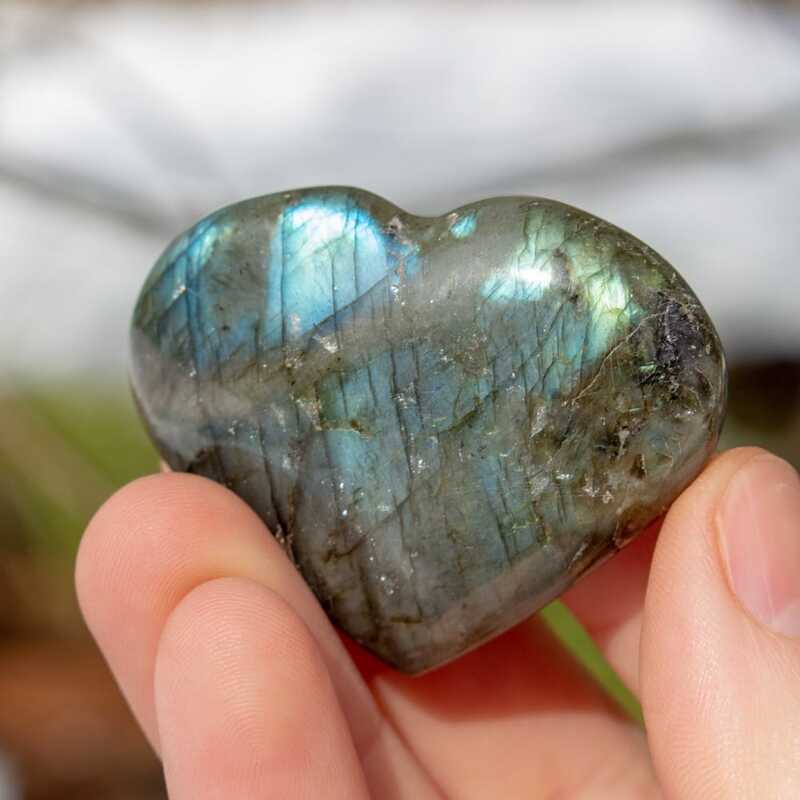 Working with Labradorite will guide and protect you on this journey and nurture your soul essence along the way, allowing us to shine brighter than ever when we return from our journey.